Lift your 2009-2011 2WD Dodge Ram 1500 Truck! Lifting a Dodge Ram is an excellent way to achieve that "Ram Tough" look. ReadyLift leveling kits are the fastest, safest, least expensive way to bring the front of your vehicle level with the rear. 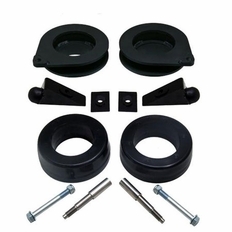 Taking our new Dodge Ram 1500 2WD Leveling kits to the next level, we introduce the 69-1035 SST Lift Kit. Our innovative Coil Spacer Technology is truly unique (Patent Pending) in the world of coil spring leveling kits. The 69-1035 2WD Dodge Ram coil spacer mounts on top of the factory coil spring and fits perfectly into the frame spring pocket. Our engineers developed an industry-first integrated spacer system that uses a CNC-machined 6061-T6 spring mount fused to a new generation polyurethane upper section which not only makes up a component of the lift, but also is designed to retain the factory ride! No other coil spring spacer on the market today is as advanced and accurately designed as the ReadyLift 69-1035 Coil Spacer! For the Rear we include new powdercoated steel 1.5" spring spacers. These spring spacers are desiged to work exclusively with the 2009-2011 Dodge Ram rear coil spring suspension. The ReadyLift 69-1035 also includes custom bump stop brackets to limit downward suspension travel while keeping the distance to factory specifications. That great ride quality is also made possible with our new machined shock stem extensions so you don't have to replace your shocks! 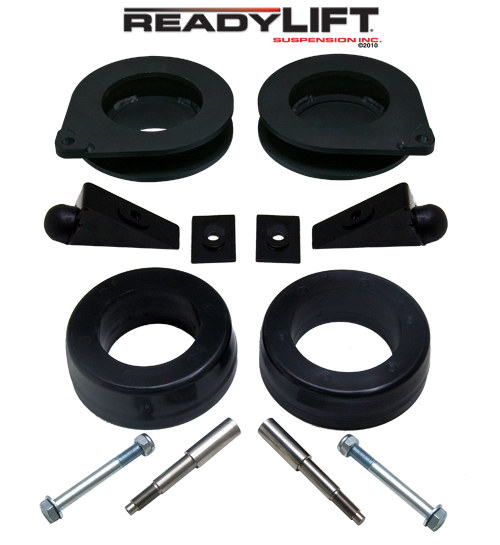 The ReadyLift 69-1035 2009-2011 Dodge Ram 1500 2WD SST Lift Kit provides 2.25" of lift in the front and 1.5" of lift in the rear to accurately raise your truck and allow for tire sizes up to 35 inches in diameter. ReadyLift leveling kits will maintain a smooth OEM ride without adding pressure to stock suspension components, guaranteed! Installation is simple and requires no cutting, or modification of factory installed parts. While other kits cost thousands to buy and hours to install, ReadyLift can be installed one to two hours and costs less than the price of a single custom wheel. ReadyLift Lifetime Warranty Included! All ReadyLift products are backed by a lifetime warranty for as long as you own your vehicle and includes all necessary parts, hardware, detailed installation instructions, and two color decals. Notes: ReadyLift is the only company that makes a custom bump stop extension for the 2WD Ram 1500. This prevents suspension damage during extreme travel.